It’s been a while since we turned our attention to Barbados’ leading export, Rihanna! Anyone seen her new music video? I could do like Sesame Street and play the game to spot what’s different… But I hated it when I was a kid and still do – so no suspense, the new film for the song “Umbrella” has no trident to indicate her Barbadian heritage! I thought using a trident was a standard trademark for her to remind ppl of her Caribbean roots… In fact the way she does the chorus for the new song with Jay-Z (the rapper turned slapper, remember?) seems as though she’s trying to copy the way the Cranberries do “Zombie” and this is ironic as they’re an Irish group!! Not impressed with the video either, I know what the name of the new album is – but I think she’s trying to force-ripe herself… She should be careful, as opening an umbrella in a room and not open air is supposed to be bad luck! How much of what Rihanna says is all about publicity? Probably most of it. We still love ya, girl. There?s little you could do wrong in our eyes. Silly Irish fellows! [She’s] #1 on the UK Singles Chart on download sales alone – the first time it has been done since chart rules changed. She knocked McFly from the top spot as she sailed to the pinnacle under the power of her ‘Umbrella‘. The Barbadian sensation is only the second artist to perform such a feat since Gnarls Barkley’s Crazy and comes after chart rules changed to allow all online releases to count towards the main countdown. ‘Umbrella‘ is a single track on her new record ‘Good Girl Gone Bad‘ which is due to be in stores June 5. Caribbean 360 is also tracing the trend how digi-downloads seem to be spelling death for the CD? Industry watchers say that the digital download business now accounts for 79 per cent of the market and pointed to Rihanna‘s success this week as evidence. Her lead track “Umbrella” on her new album “Good Girl Gone Bad” shot to the number one position on the Single Chart Sunday night on download sales alone. It was the first time since the chart rules changed to include downloads that a song had made it to the top on download sales alone. Well, we’re glad for Rihanna and her soaring climb of success, but do not forget where you came from and who rooted for you! Bring back the Trident! I see no reason why she should use a “Trident”. So she is to stop remembering her homeland? Next thing she should lose the Bajan accent too? Get the money and f*** off your homebase? Be totally Hollywood? When a Jamaican is abroad, or a Trini for that matter, they NEVER 4get their navel-string! They will jook soca/reggae in ya ears til they bleed, and mek ya chomp on ackee&saltfish or pastelles til you burst! Rihanna said in her early interviews that the trident is to remind everyone where she came from, she even bragged about wukkin’ up on Regis + Cathy! Now, she get contracts with Nike and LG and Cover Girl, she suddenly drop the icon that helped push her there? 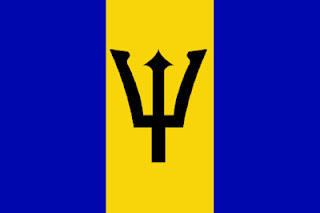 Being a Barbadian was a selling point, and never forget nor forsake that!